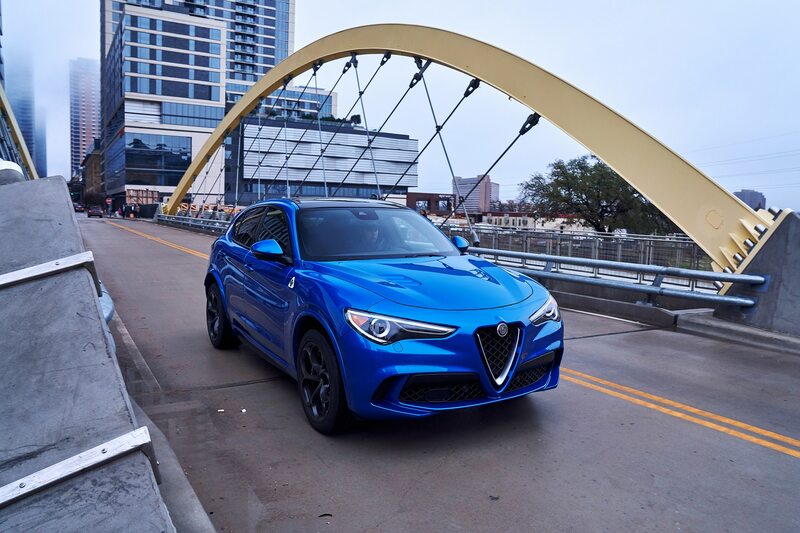 AUSTIN, Texas — The speedometer needle is closing in rapidly on 140 mph as we fly underneath the pedestrian bridge on the back straight at Circuit of the Americas, a track that caters to ultra-high grip, and horsepower Formula 1 race cars. 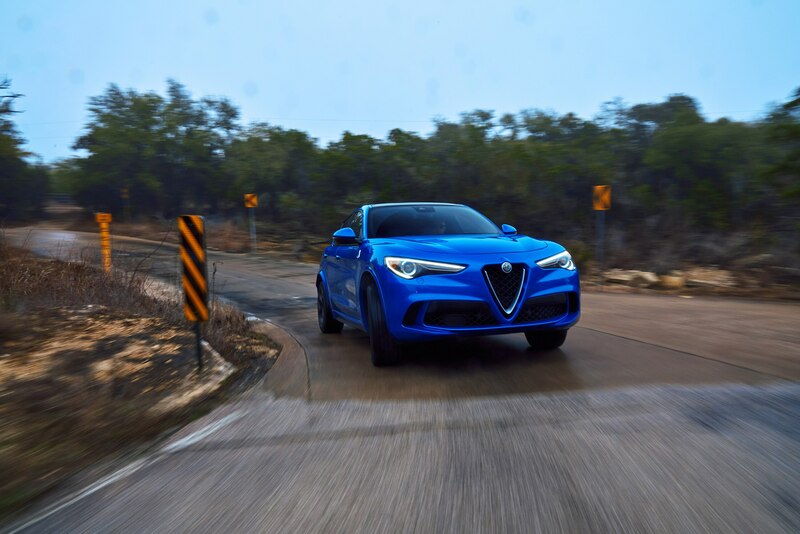 Accelerating down the long straight from the tight turn-11 hairpin is an experience to savor, but now we’re hard on the brakes for the 90-degree left that we were approaching at massive speed just a moment ago. 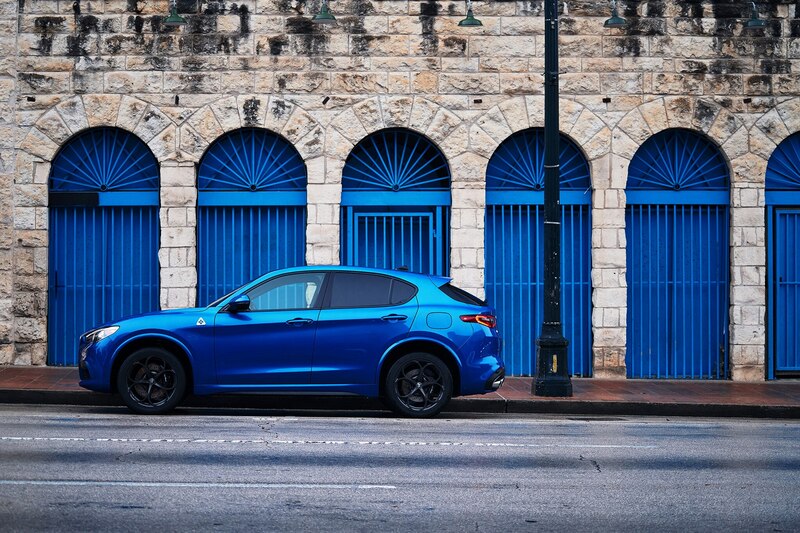 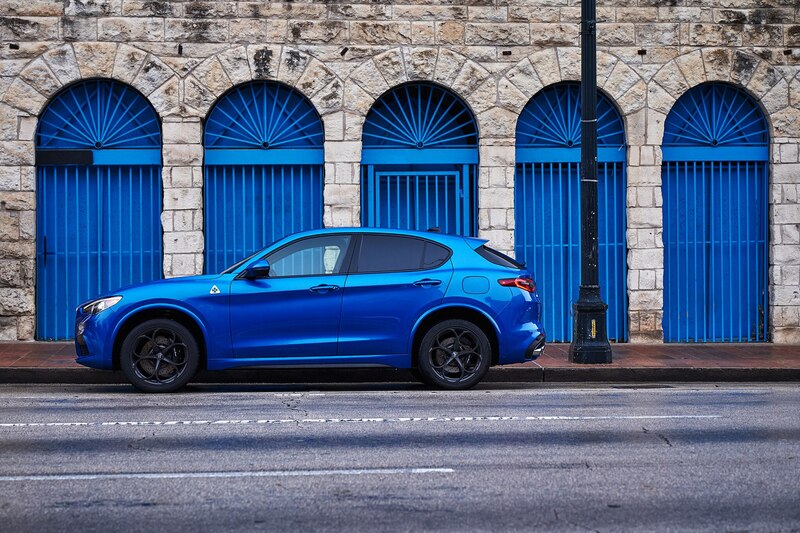 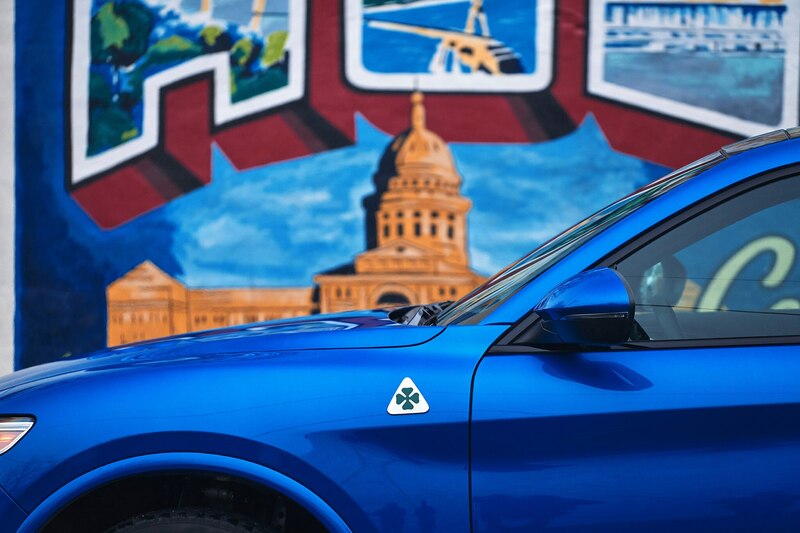 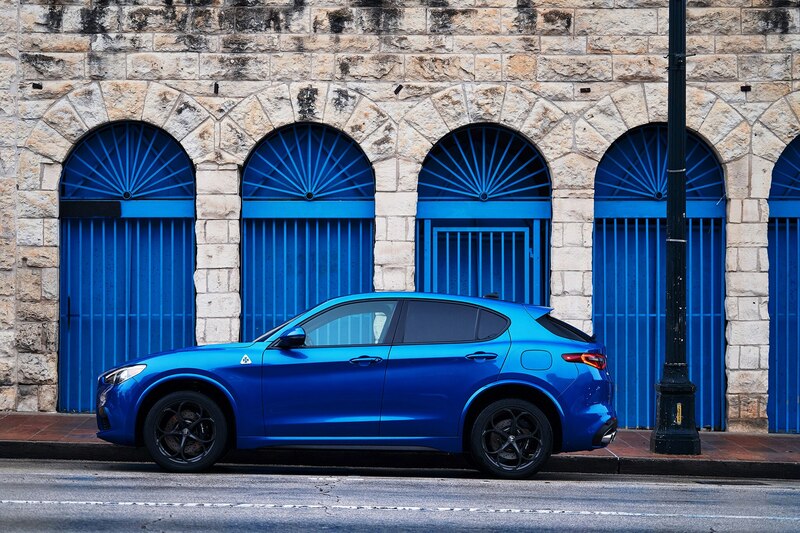 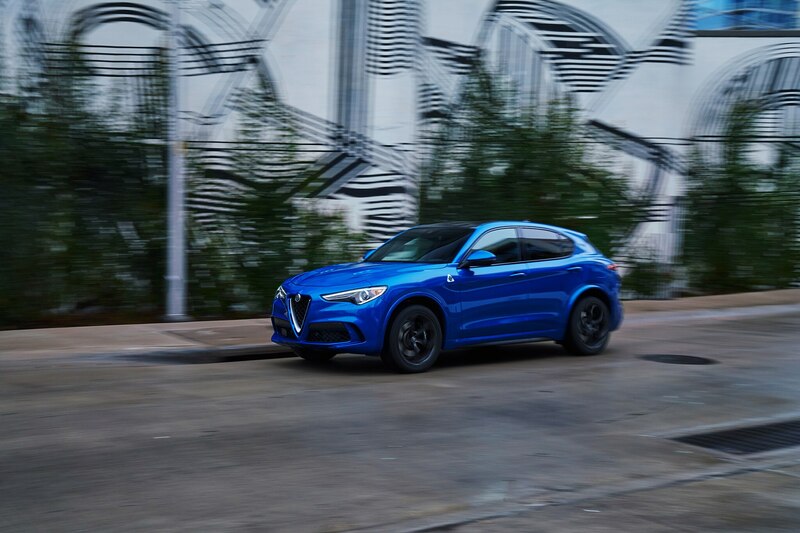 Like its Giulia sibling, the 2018 Alfa Romeo Stelvio Quadrifoglio’s brakes are sharp and strong, and the steering is super quick. 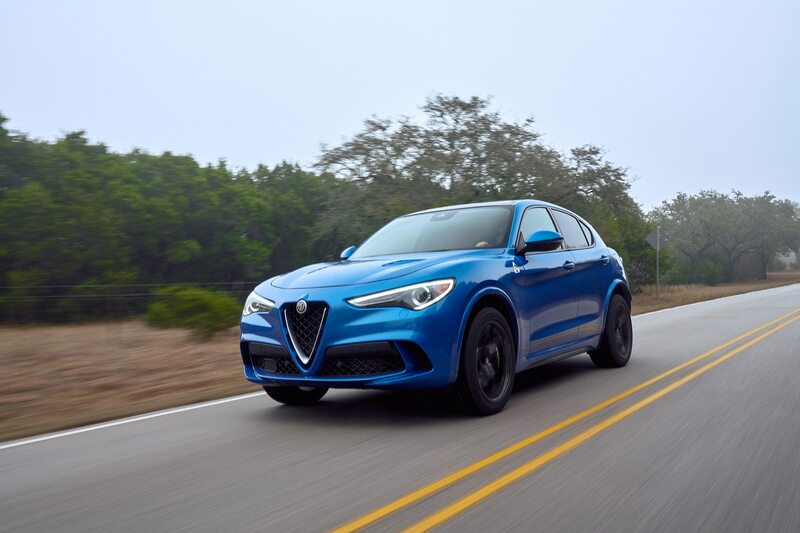 Just a small flick left and we’re clipping the curbs and back on the gas, thundering down the short straight between turns 12 and 13 with staccato bangs coming from the exhaust on each up shift. 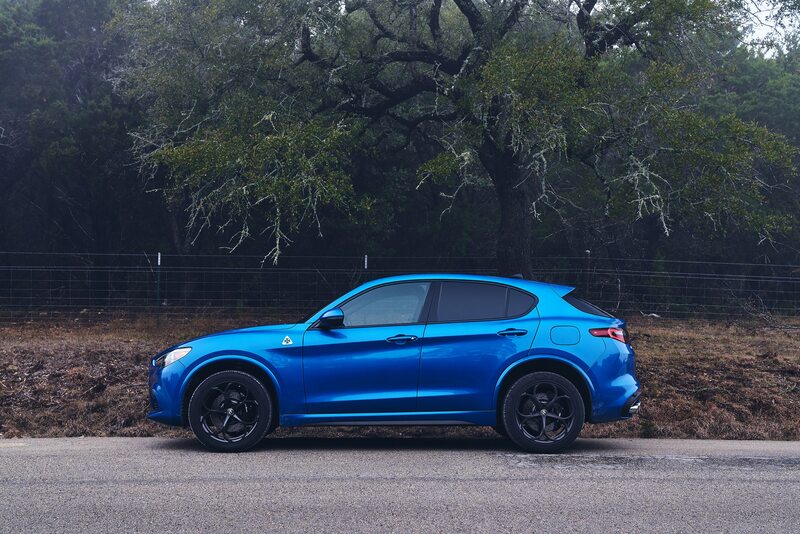 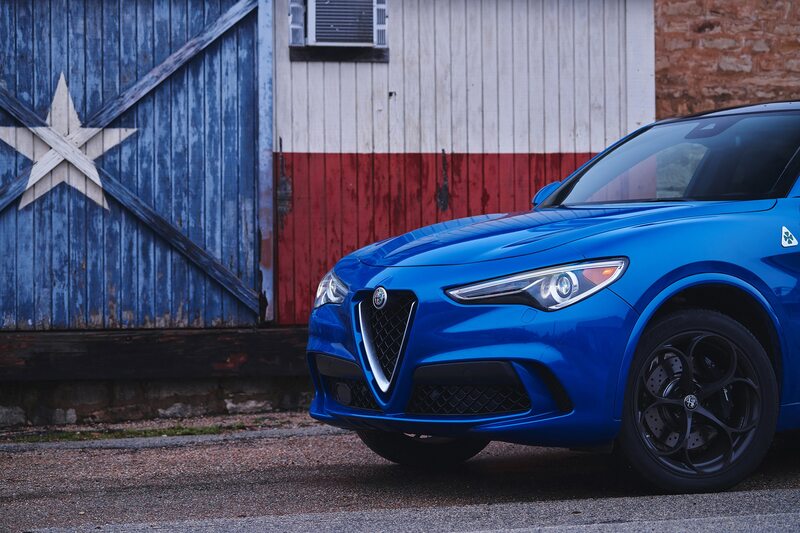 Yeah, the Stelvio is technically a utility vehicle, but it’s really more of a performance vehicle. 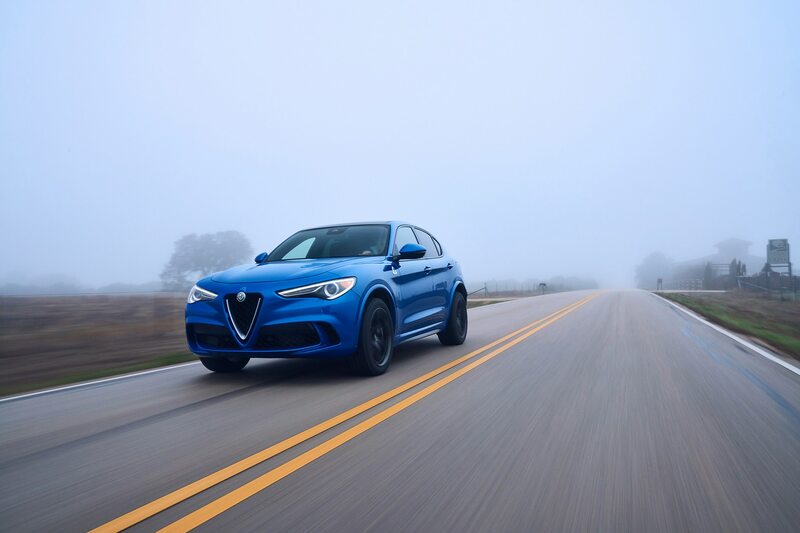 Think of Alfa Romeo’s new Stelvio Quadrifoglio instead as a taller, all-wheel-drive Giulia Quadrifoglio sport sedan–that’s pretty much what it is, being based on the same chassis and suspension design, and featuring the same 505-horsepower, twin-turbocharged, 2.9-liter V-6 engine and eight-speed paddle-shift automatic gearbox. 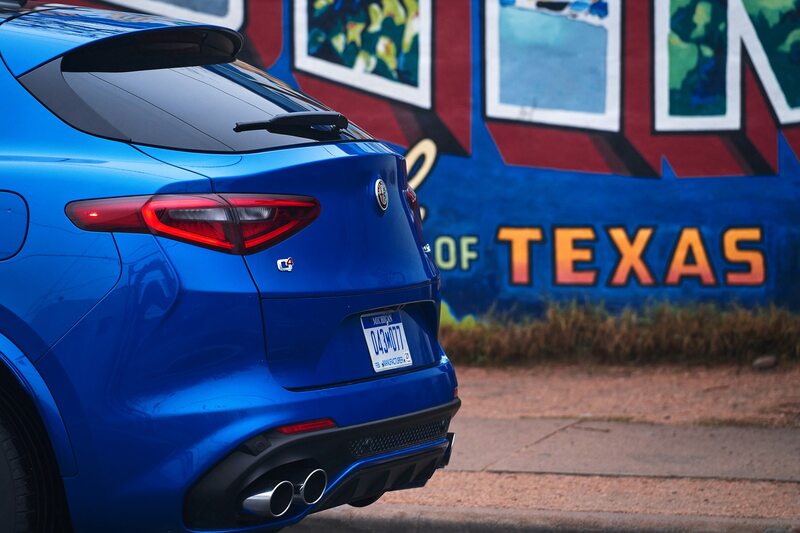 Sure there are a few differences underneath the Stelvio’s seductive shape (mostly to accommodate Alfa’s Q4 all-wheel-drive system–the Giulia Quadrifoglio is RWD only), but the similarities are enough to make one wonder why (besides genuinely preferring the Stelvio’s aesthetics) anyone looking for this level of performance would choose the Stelvio over the Giulia. 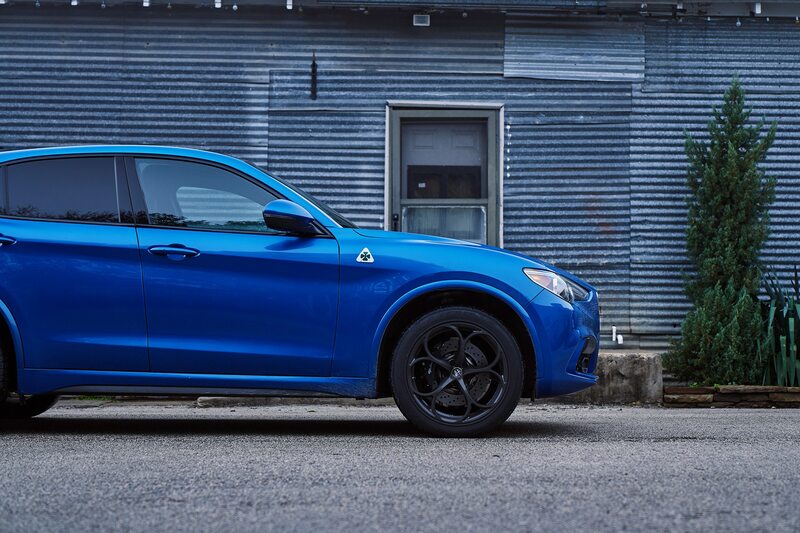 That might be a little bit of an oversimplification. 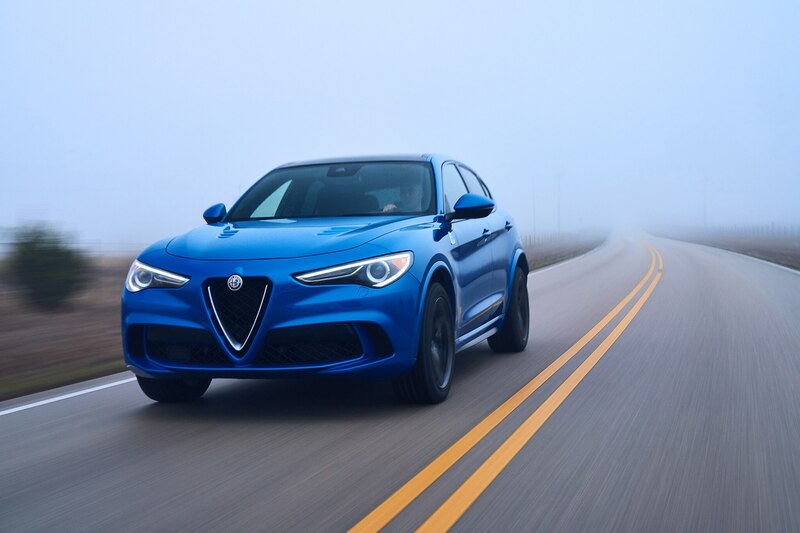 People in a four-seasons climate that want to use their 505-hp car on a daily basis may need that all-wheel-drive system and those who shuttle their children daily may want the small additional amount of cargo space that comes from the Stelvio’s five-door design. 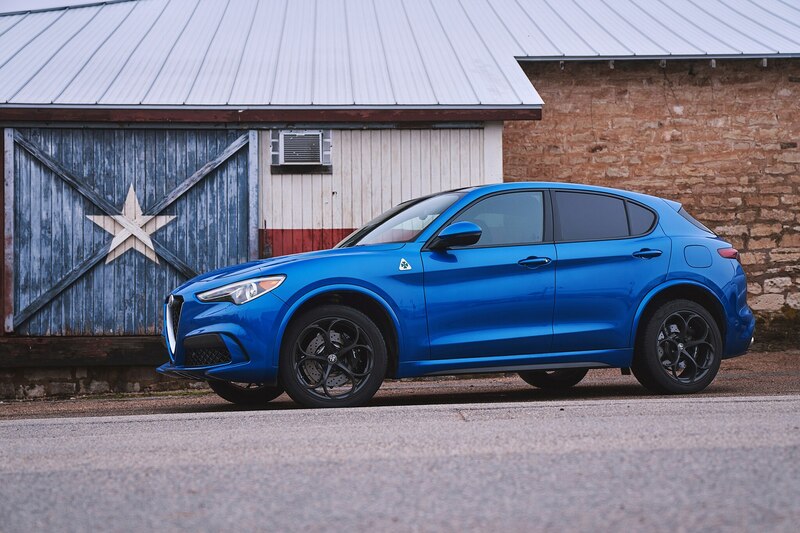 But don’t kid yourself. 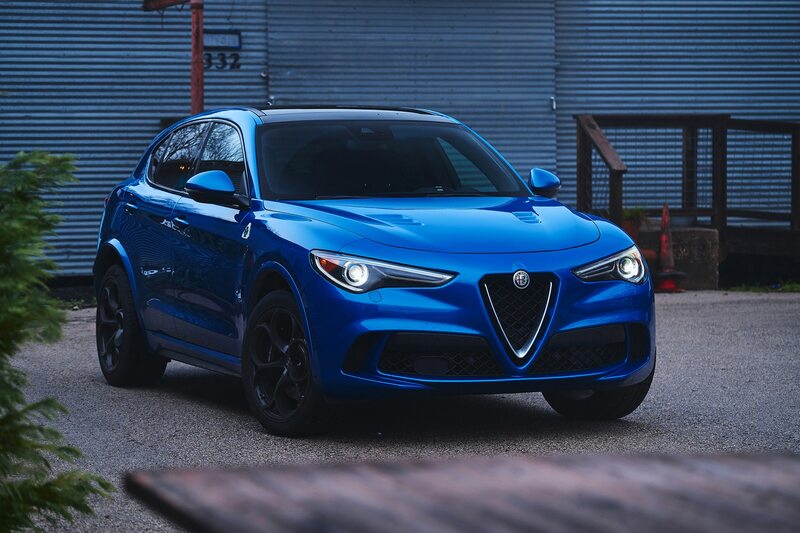 This isn’t an SUV in the traditional sense. 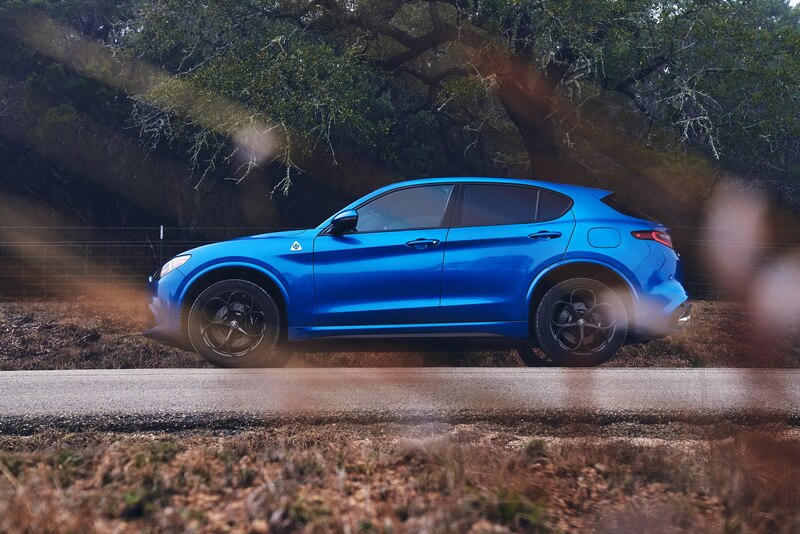 It’s been tuned to go fast and even the softest of the three suspension settings will have you spitting your teeth out if you so much as look at a rutted dirt path, never mind an actual off-road trail. 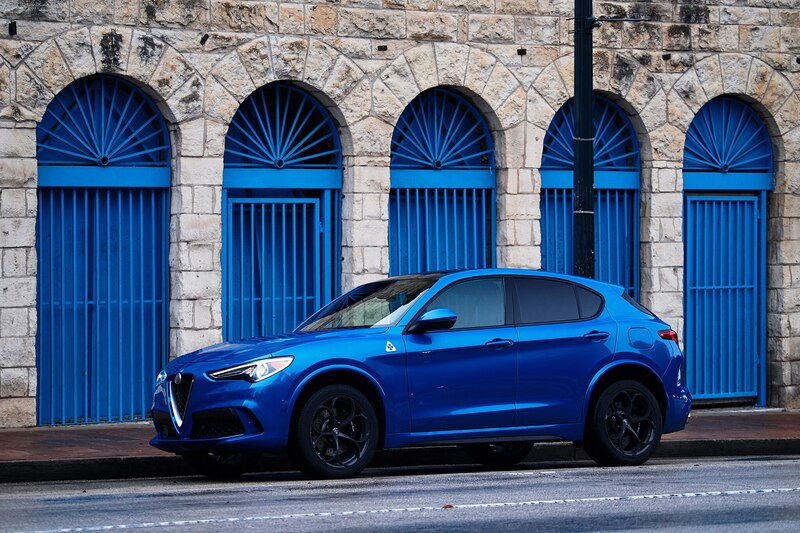 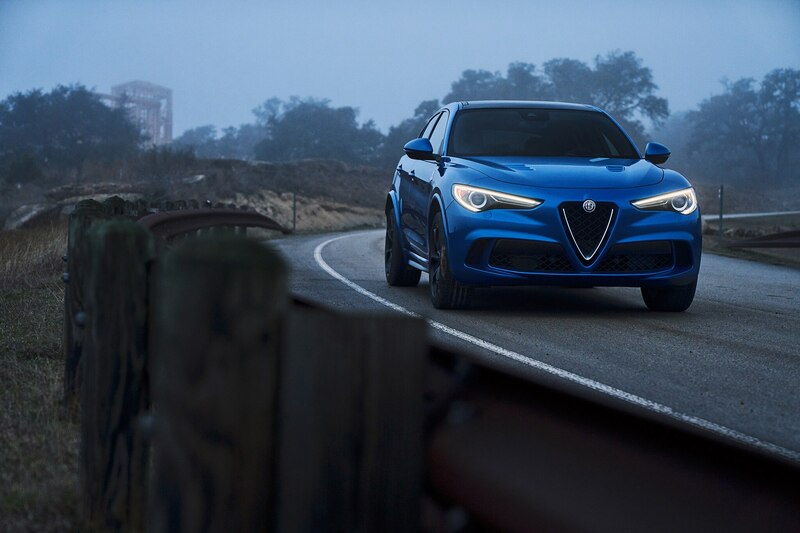 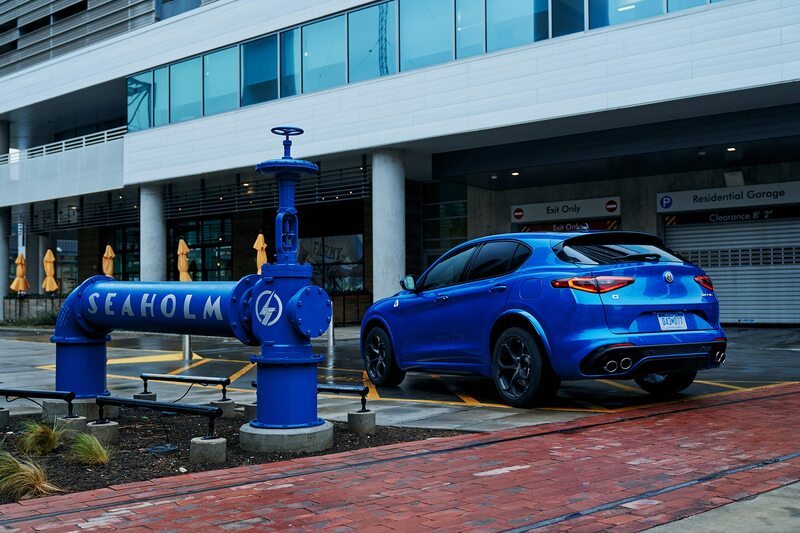 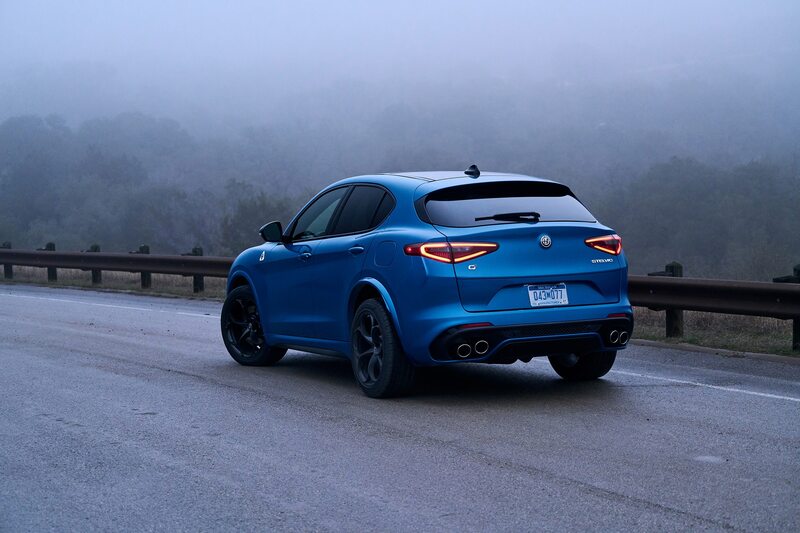 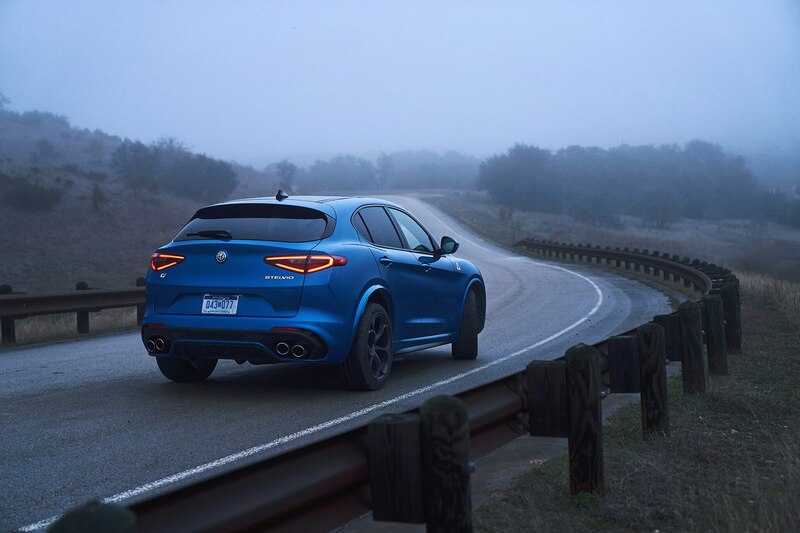 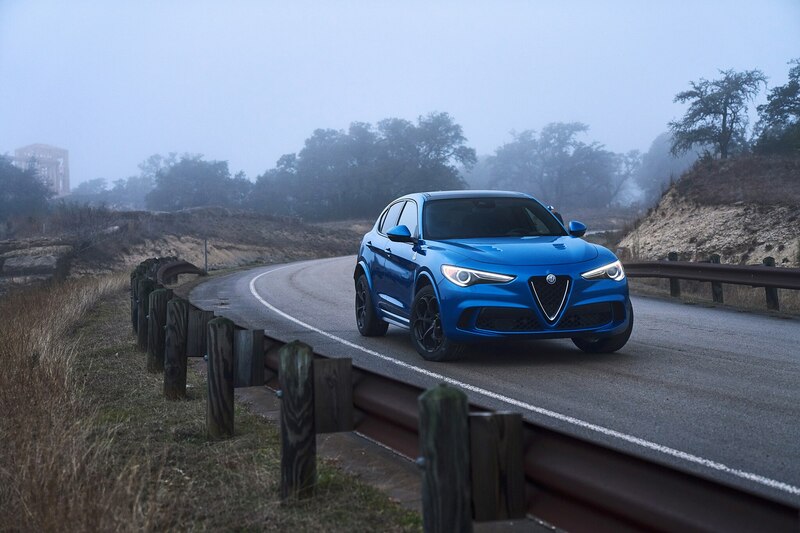 Alfisti will be happy to know that the Stelvio Quadrifoglio is nothing less than a pure performance machine. 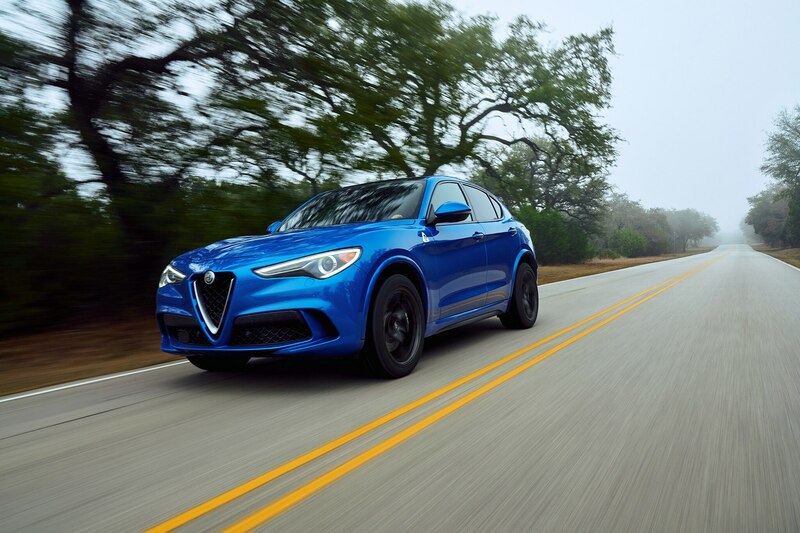 In fact, Alfa Romeo says that because of the all-wheel-drive system, the Stelvio Q actually beats the Giulia Q out of the hole, and on to a 3.6-second 0 to 60 mph time (vs 3.8 seconds for the Giulia Q). 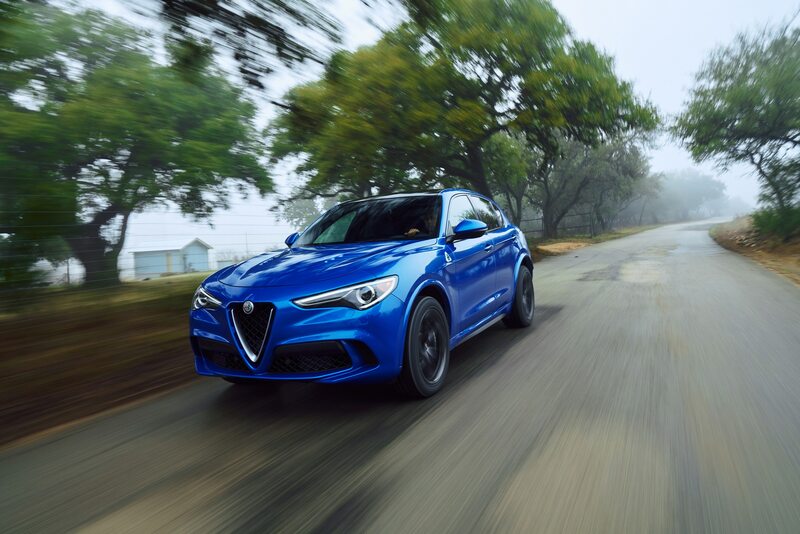 Top speed is a huge 176 mph and Alfa isn’t shy to tout the Stelvio Q’s 7:51.7-minute Nürburgring lap time–it’s a record for the Stelvio’s segment. 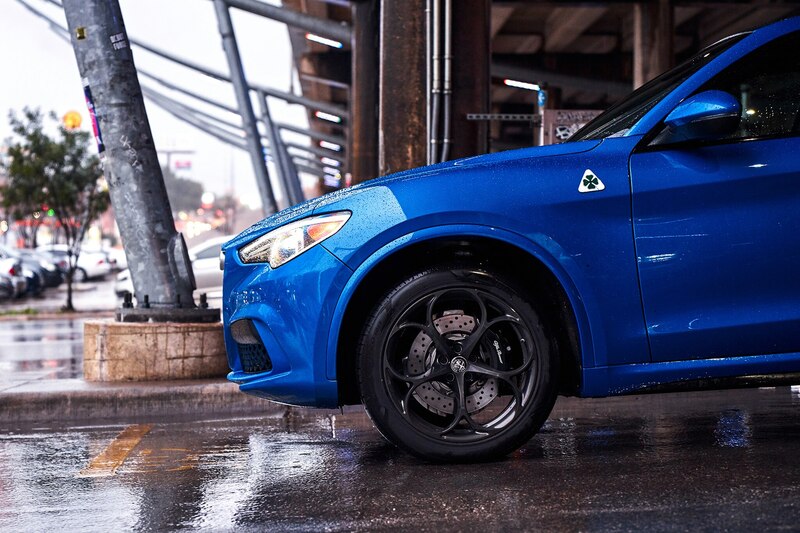 Brakes have been upgraded to Brembo six-piston front and four-piston rear calipers and there’s even an $8,000 carbon ceramic option. 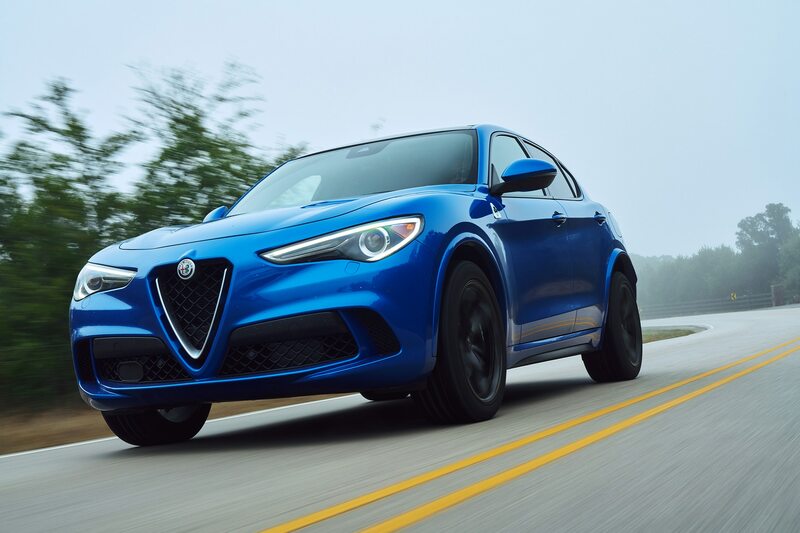 Most body panels are crafted from aluminum for weight savings, there’s a carbon-fiber driveshaft and the wheels are 20-inchers with meaty 285-width rear tires. 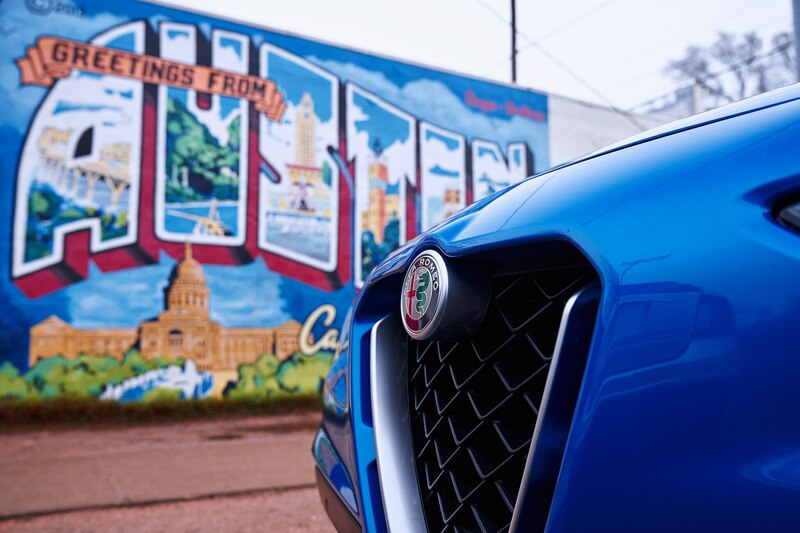 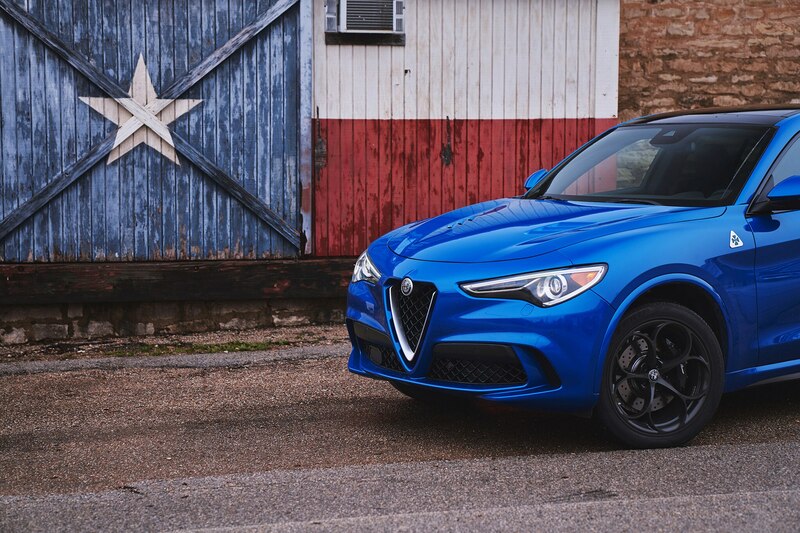 Alfa claims a best-in-class power-to-weight of 8.7:1 for the 4,360-lb Stelvio Q. 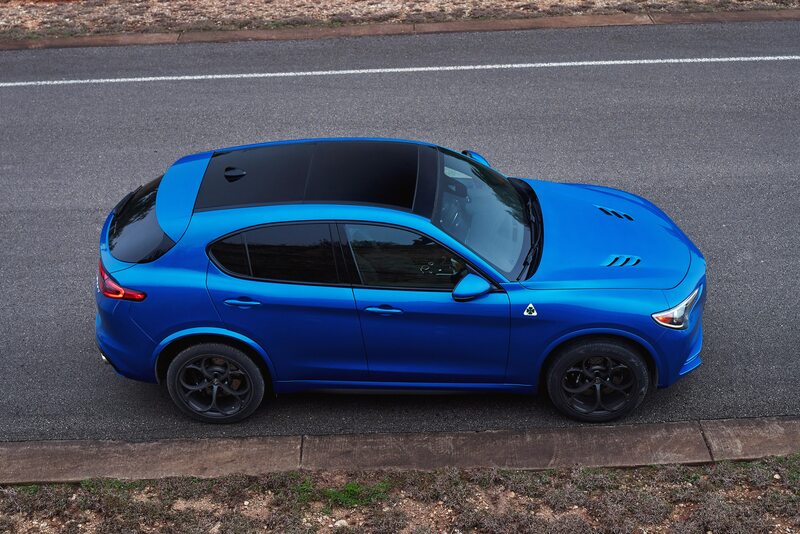 This Quadrifoglo version gets plenty of special cosmetic touches too. 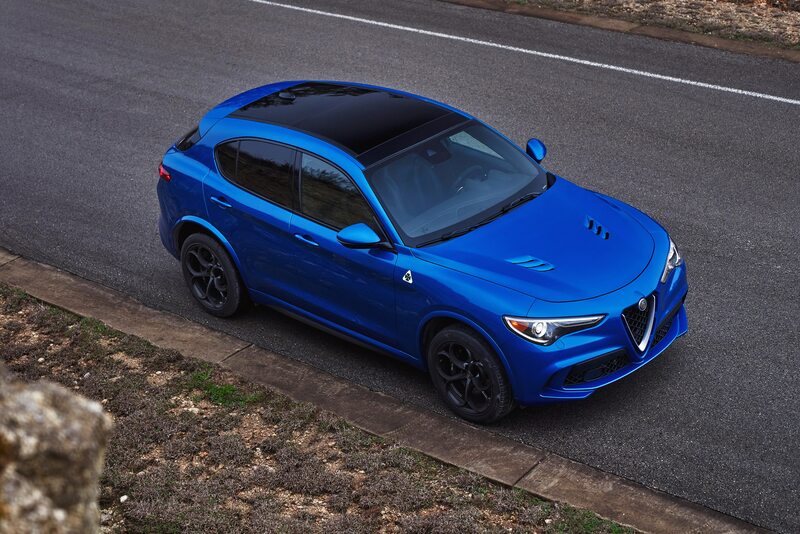 Those hood vents, for example, and the side skirts. 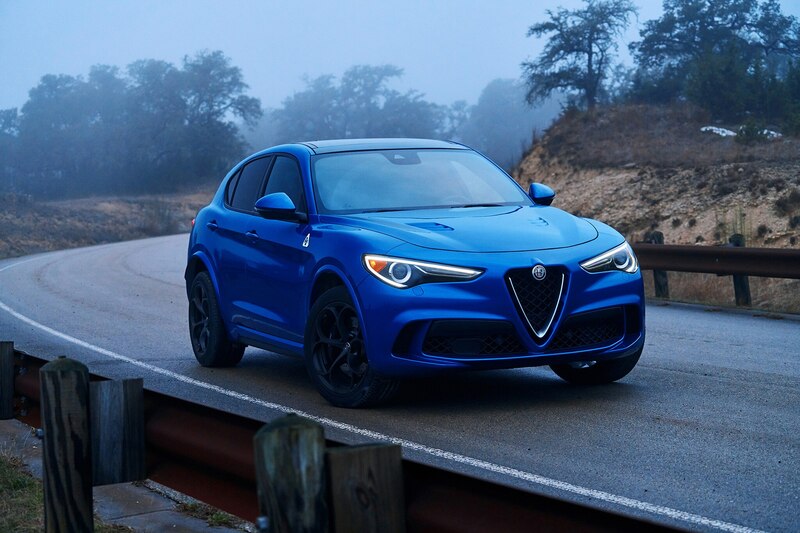 The front bumper is revised for more airflow for cooling and the rear bumper has cut-outs for the quad exhaust tips that exit through it. 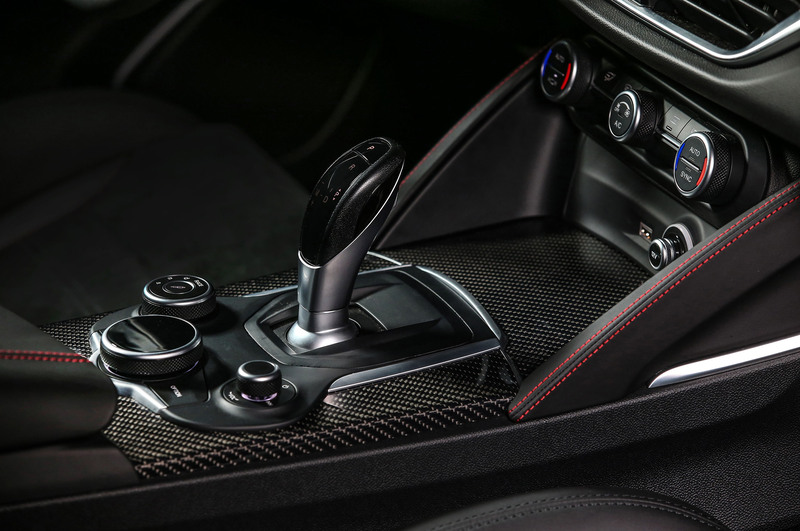 Inside, Sparco carbon-shell bucket seats are an available option while real carbon fiber, metal and leather trim are nearly everywhere. 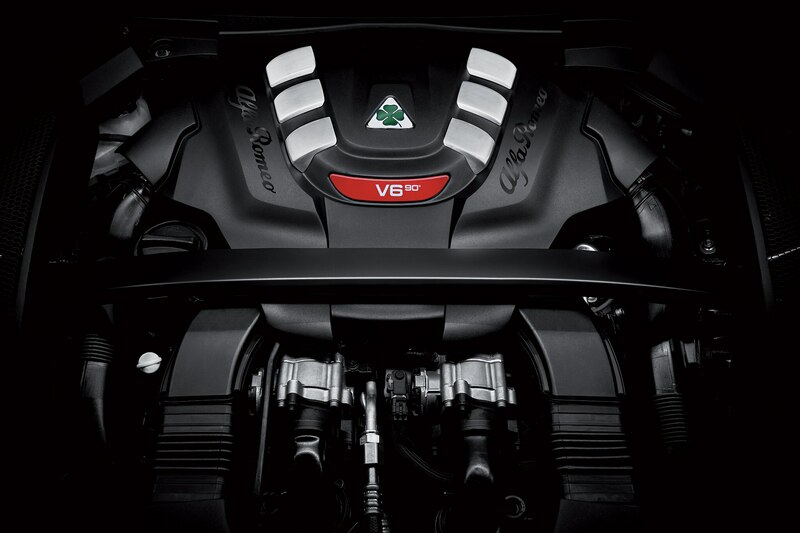 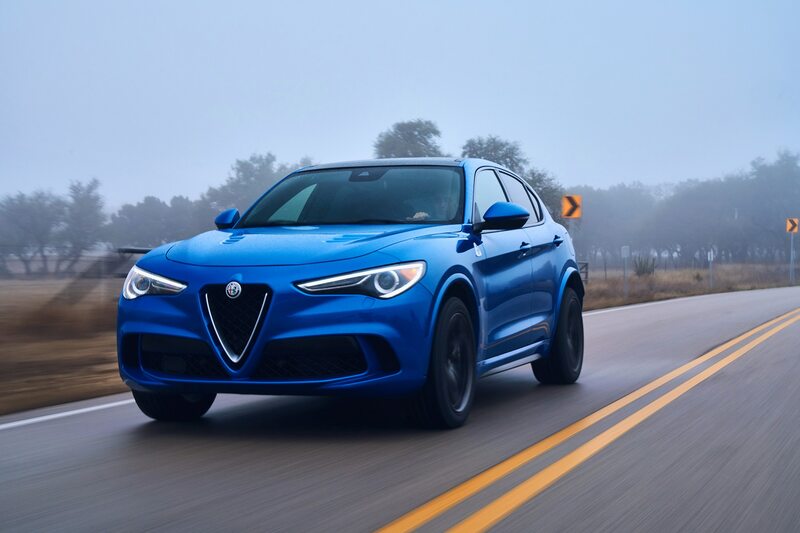 A 200-mph speedometer and small Quadrifoglio emblem on the instrument cluster silently hint at the available performance. 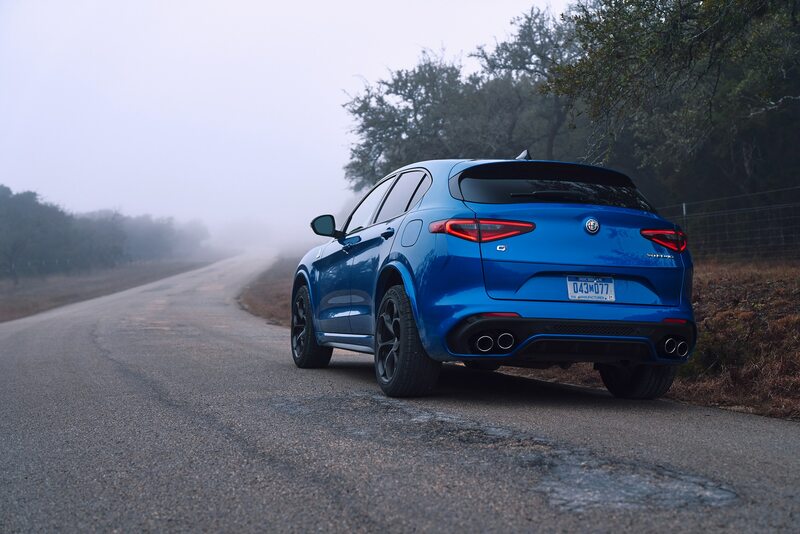 Before we hit the track, we drove and rode for a 100-mile road loop with varying roads, from freeway to meandering backroads. 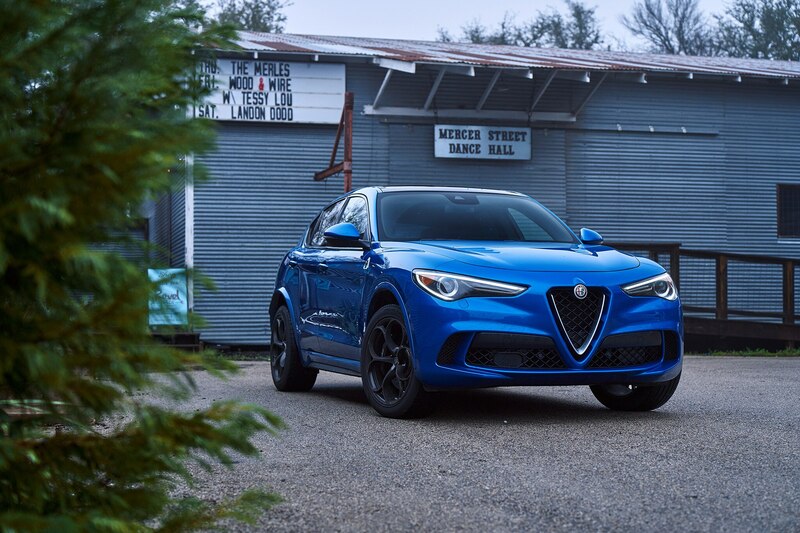 With Alfa’s four-way DNA drive mode selector in Normal, the Stelvio Q’s suspension stays in its softest mode, but soft is relative. 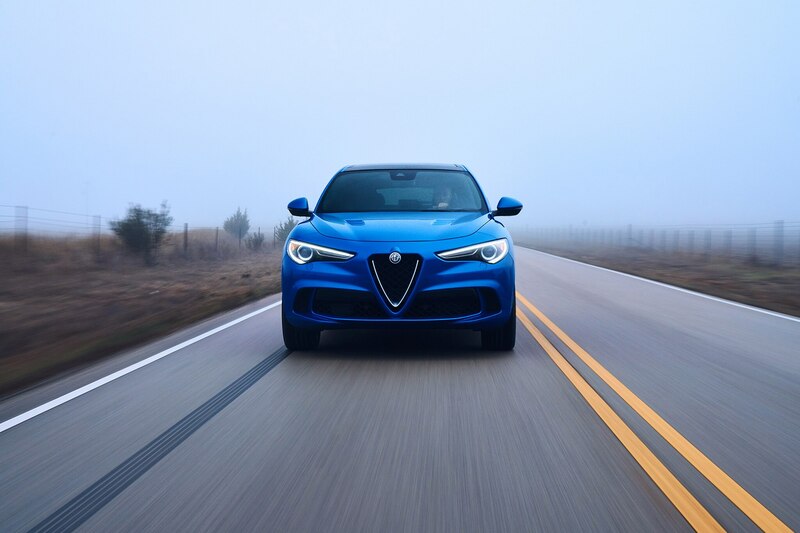 While the ride is fairly calm on well-maintained freeways, it’s busy on anything less smooth, with lots of head and body movement to occupants. 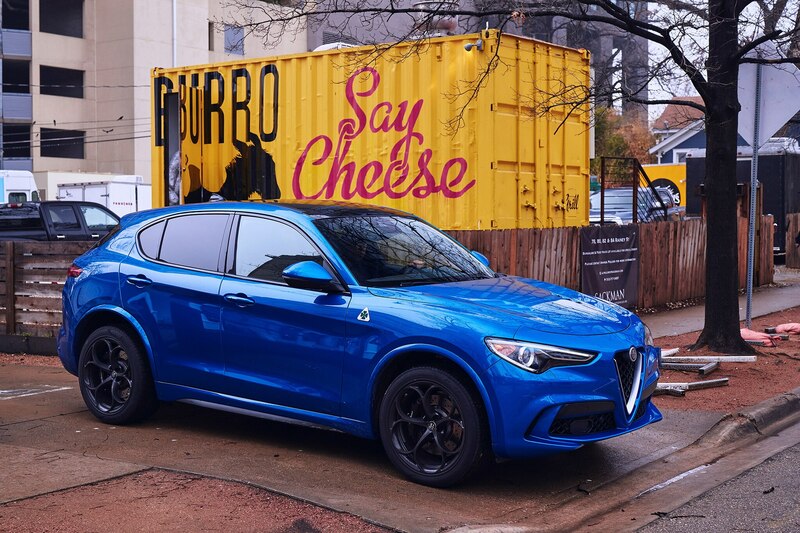 Add in the Stelvio’s quick steering and grabby (and super strong) brakes and we fear the result is a vehicle that would quickly become tiresome on, say, a multi-day road trip on less than perfect roads. 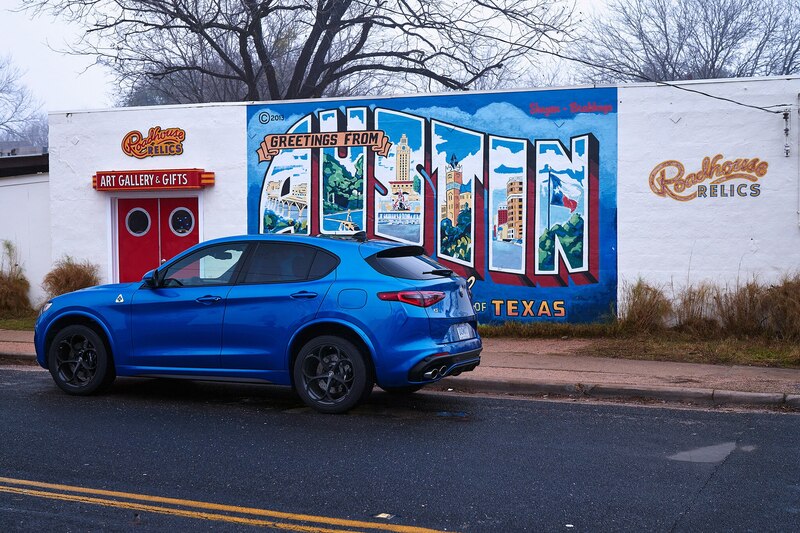 A Porsche Macan Turbo was on-hand for road evaluation and we found it to have a slightly more compliant base suspension setting and more relaxed on-road driving characteristics that subtly increase the Porsche’s usability bandwidth. 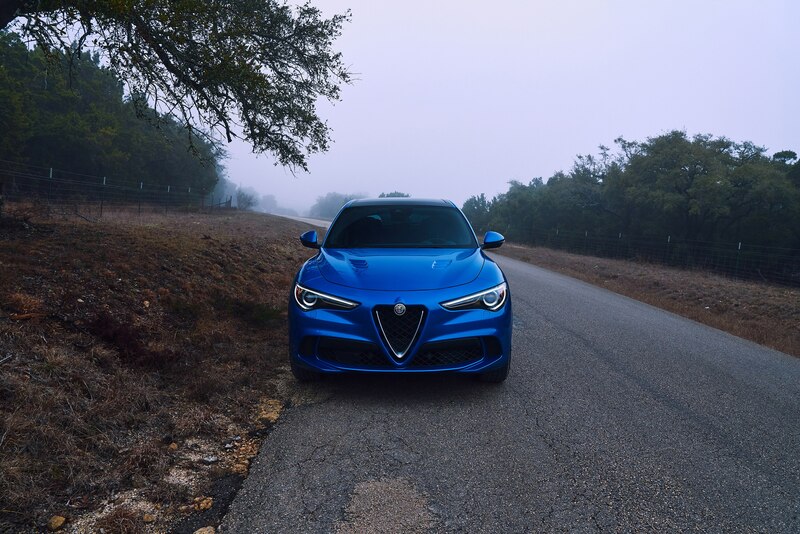 Other downsides for daily use include a very well integrated but slightly fussy infotainment system, with sharp graphics but limited zoom-out on navigation and an interface that could use more hard buttons to quickly get to main functions. 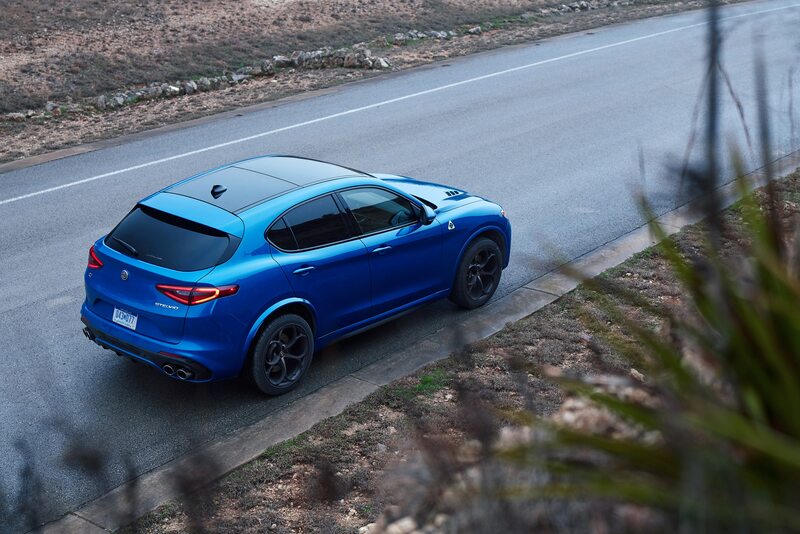 Nevertheless, rear seat room is adequate for six-footers and ingress/egress to the rear seat, often lacking in performance four-doors, is quite good. 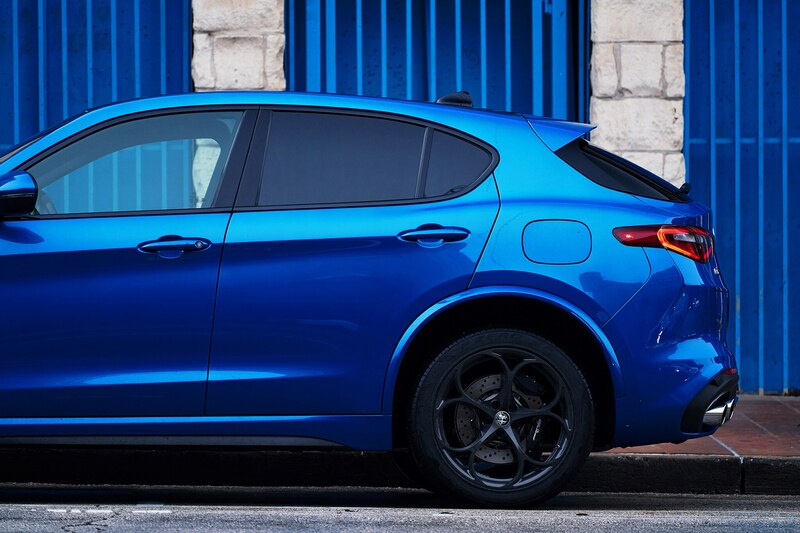 Cargo space is also more than adequate. 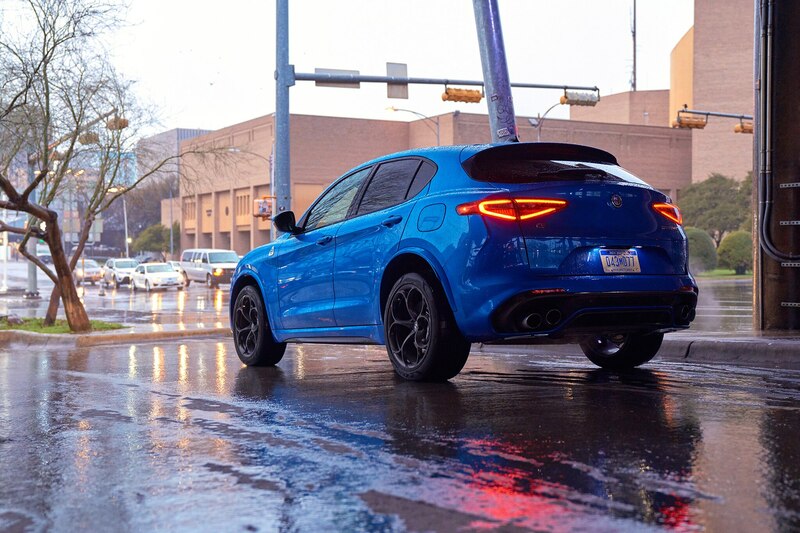 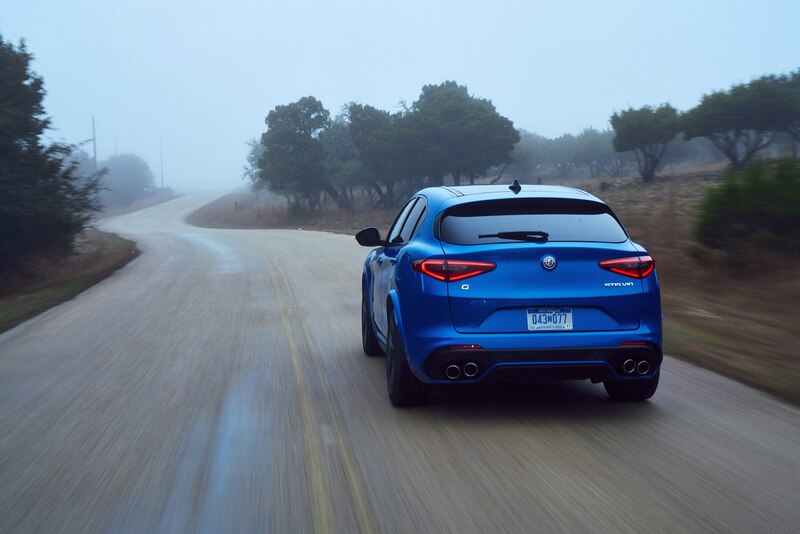 Of course the track is really where the Stelvio Q shines, as we found at Circuit of the Americas, on asphalt that was still drying from some morning rain. 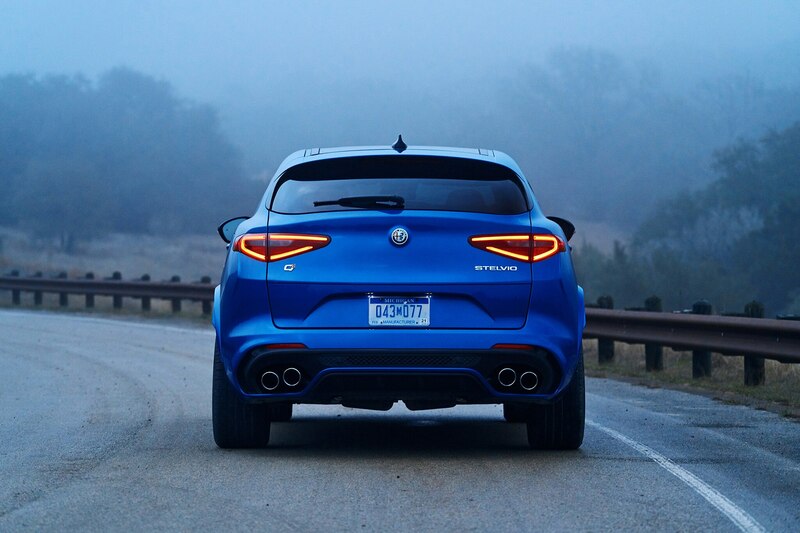 Grip from the all-wheel-drive system, capable of sending 100-percent of power to the rear wheels, is remarkable, but the Stelvio Q is still very willing to be driven on the throttle, the rear end responding benignly to our right foot, making it a breeze to change the car’s behavior mid-corner. 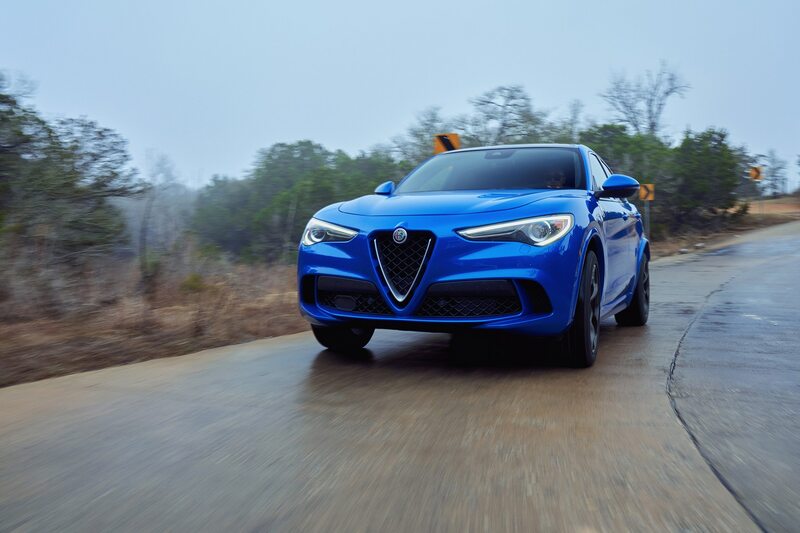 Dive in too quickly to COTA’s tighter corners and you’ll get some initial understeer, but throttle adjustment brings the rear around easily and enjoyably. 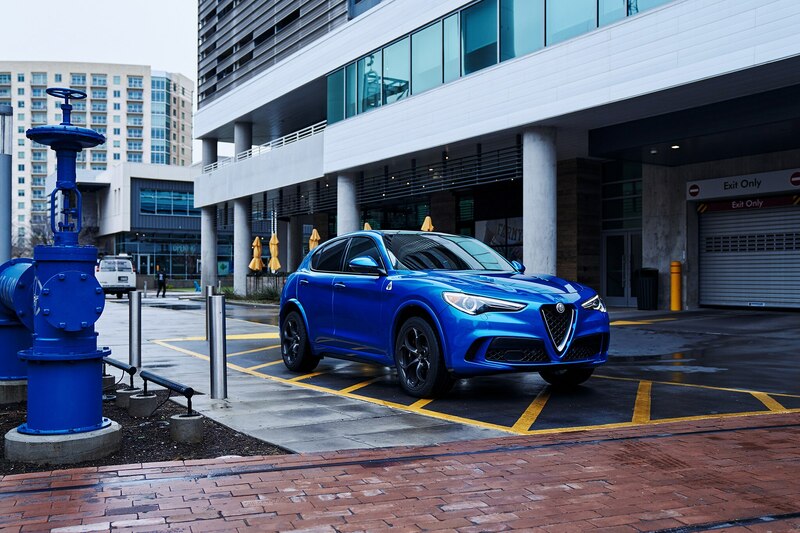 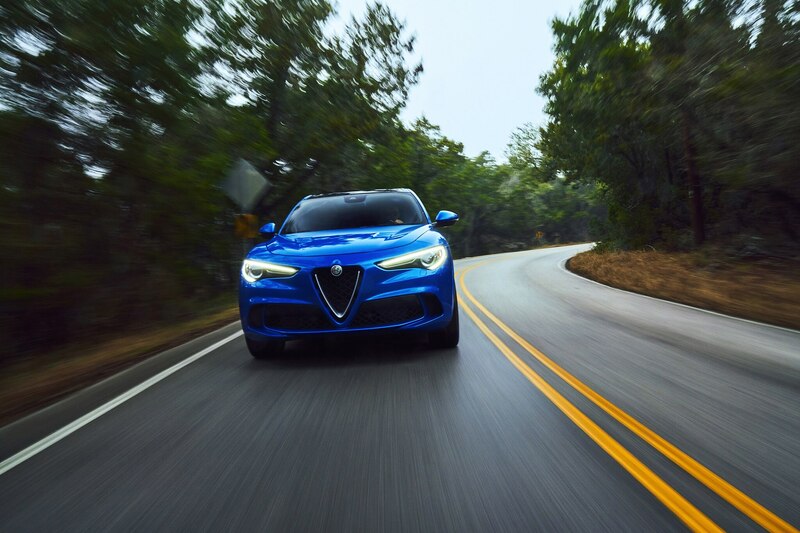 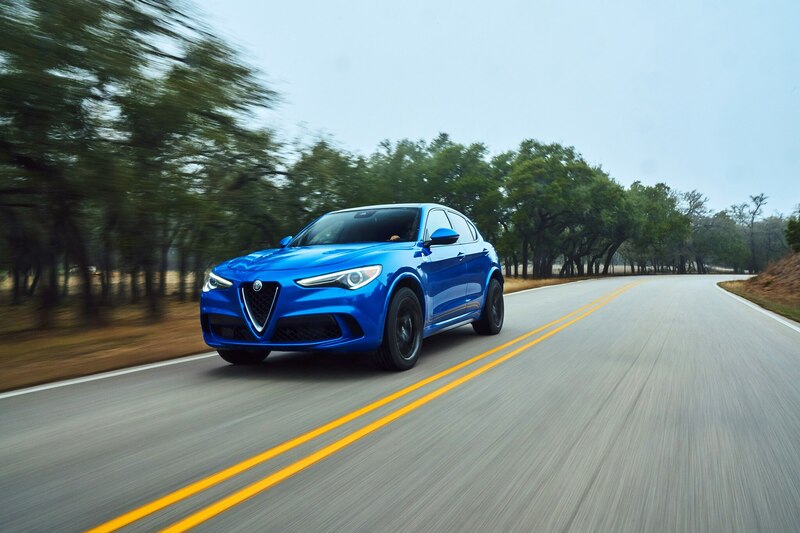 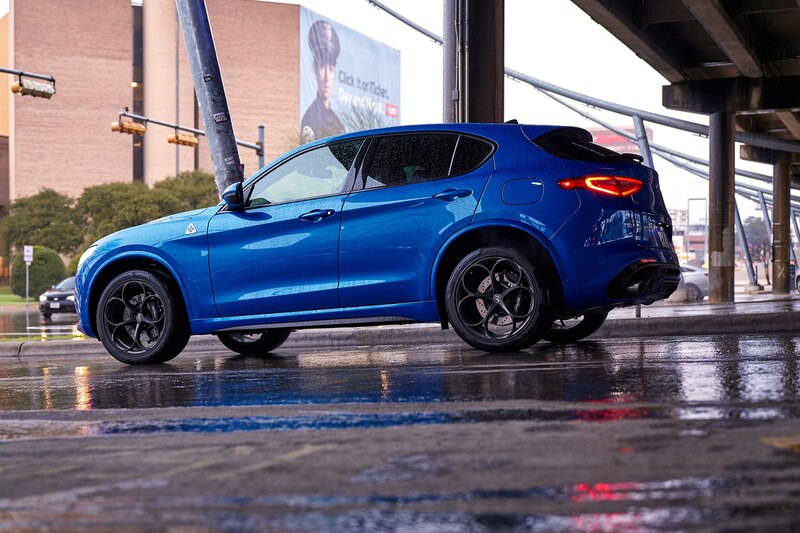 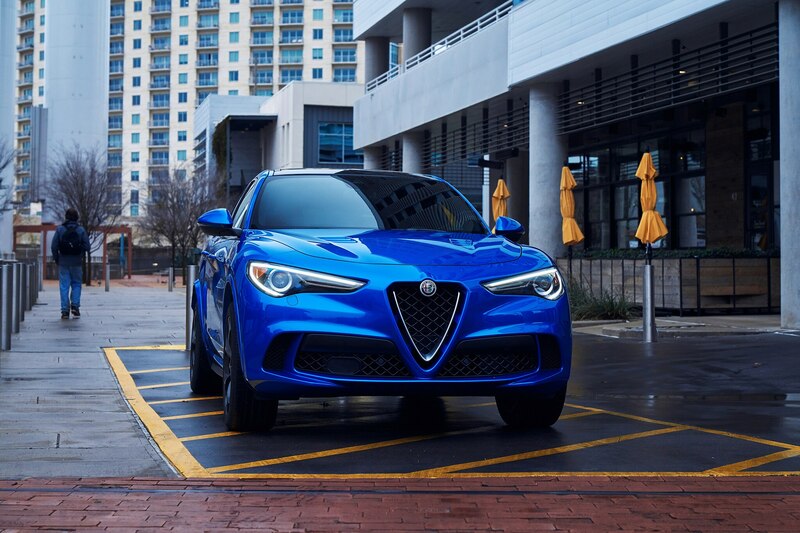 Drive the car smoothly, maintaining momentum through COTA’s S-curves and the Stelvio’s balance is sublime–virtually neutral, even with stability control off in the DNA selector’s Race mode. 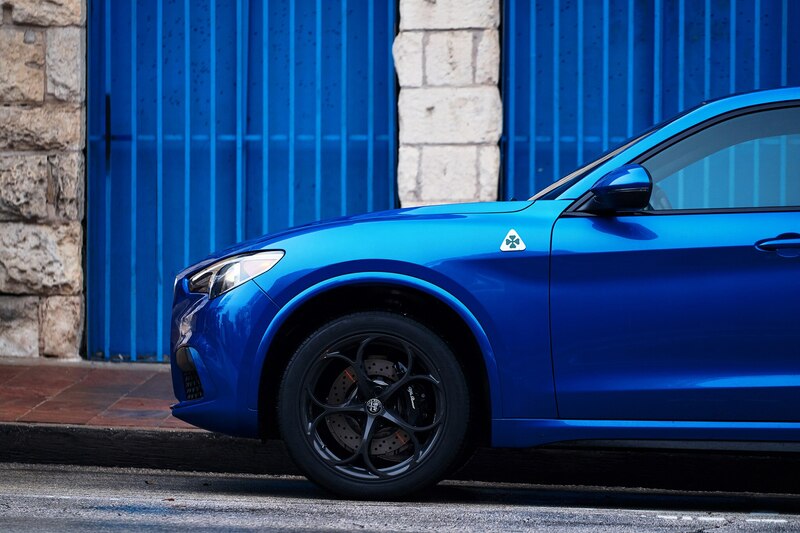 All of our track testers were equipped with the optional carbon ceramic brakes, which worked wonderfully, giving only a little extra noise compared with their steel siblings. 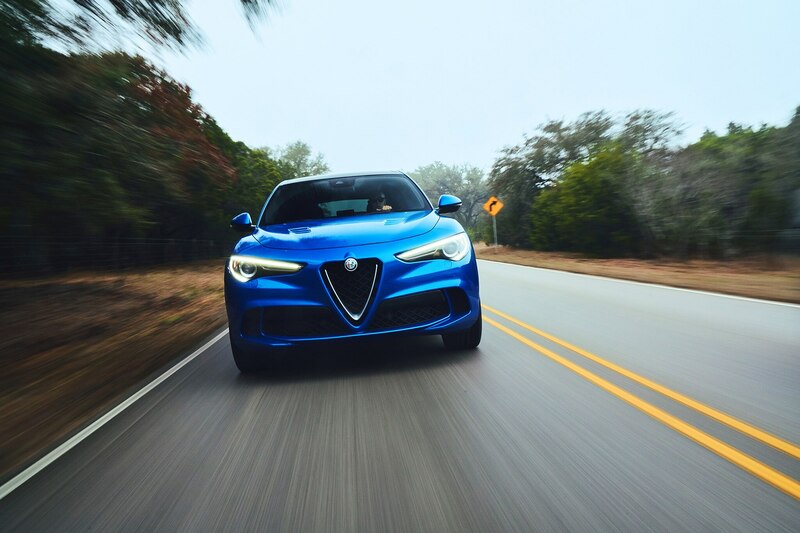 Repeated stops from high speed were met with full confidence and no extra travel. 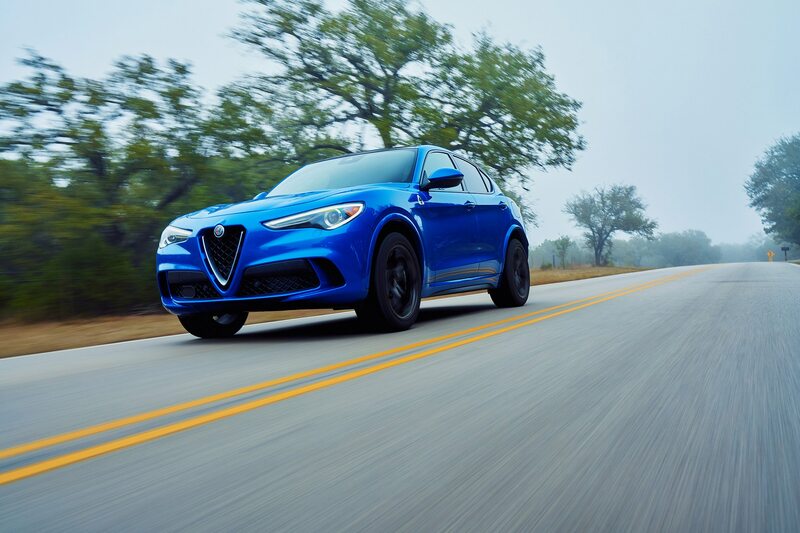 We also enjoyed the eight-speed transmission, the large, column-mounted Ferrari-style aluminum paddles giving satisfying feel and rapid, rev-matched downshifts to boot. 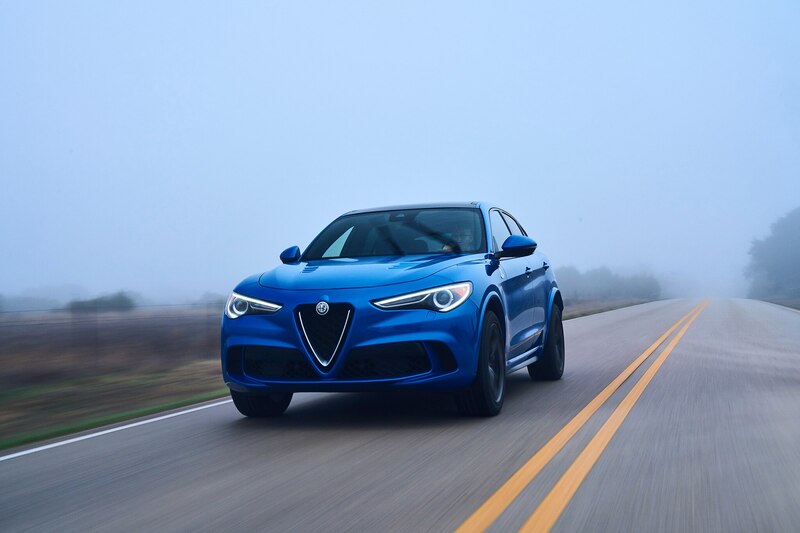 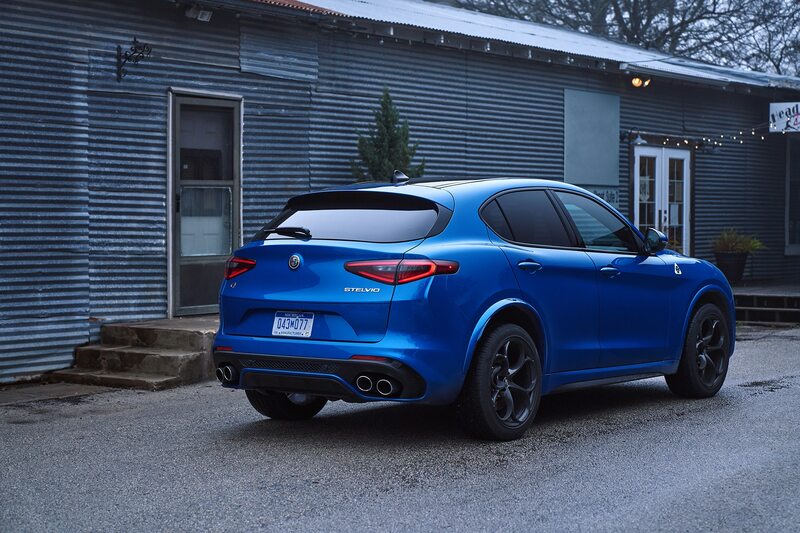 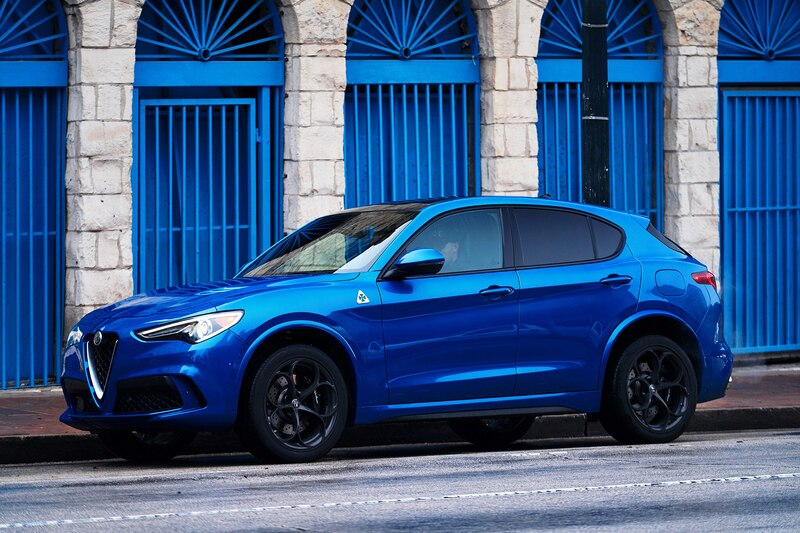 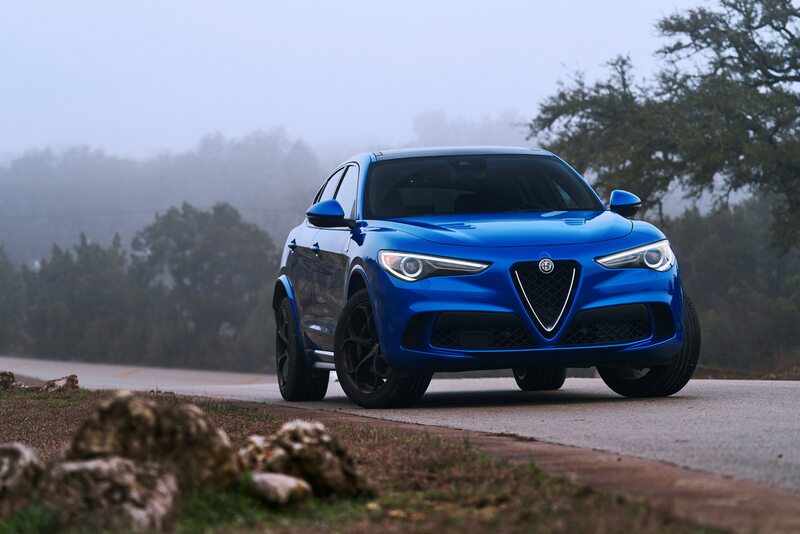 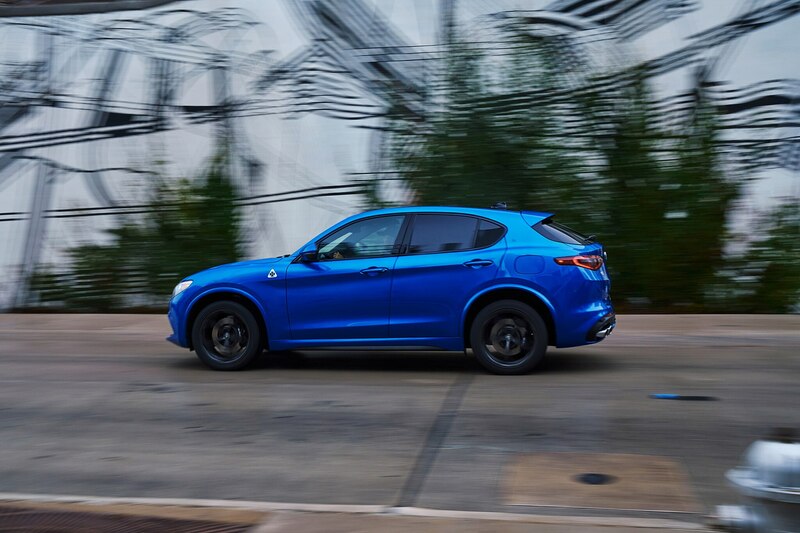 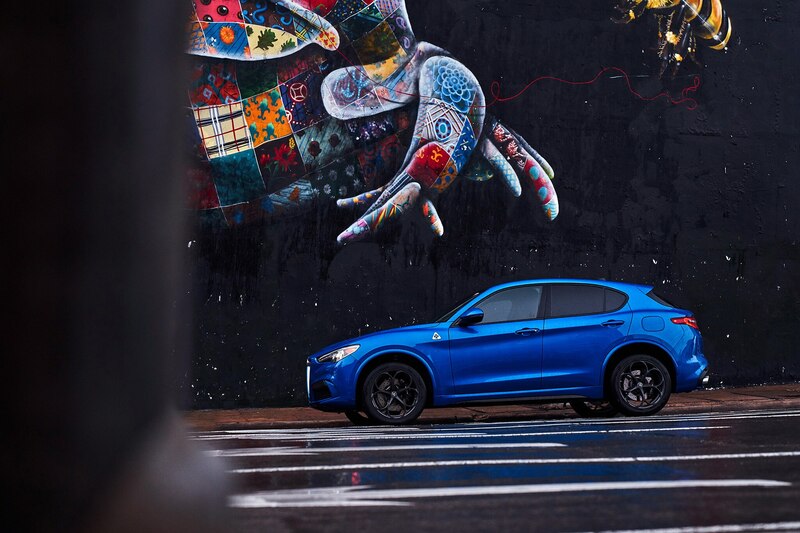 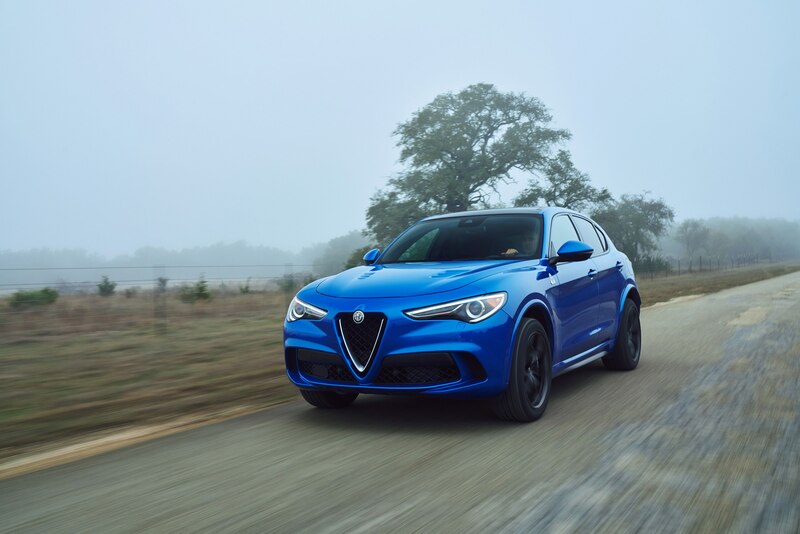 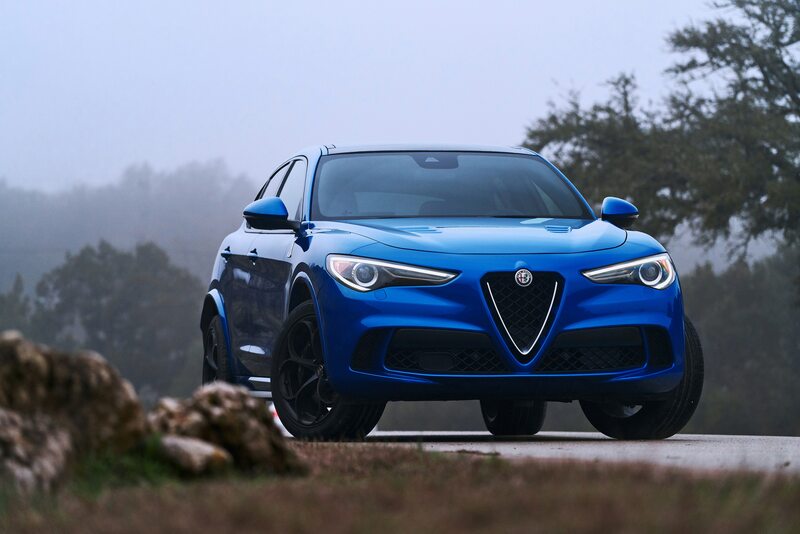 Upshifts are met with a sharp bang from the exhaust on full-throttle upshifts, adding to the aural delight emanating from the Stelvio’s barking V-6. 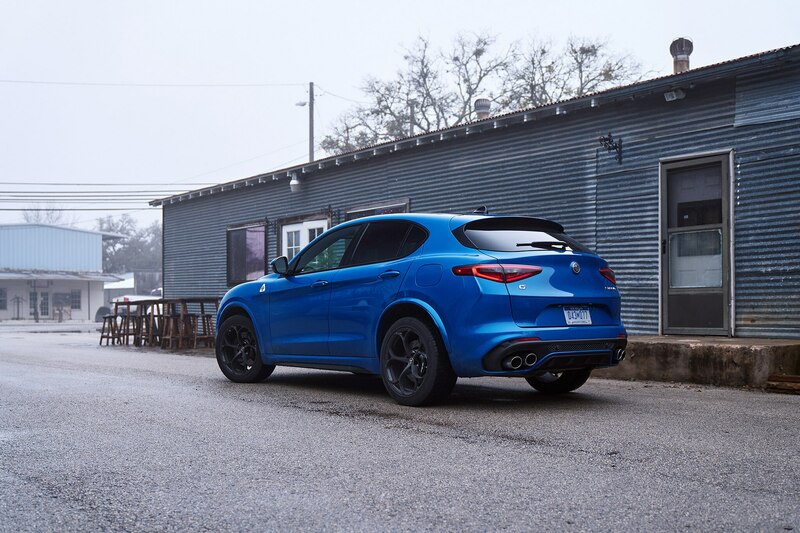 The optional Sparco carbon seats look the business, but didn’t seem to offer a ton of extra support over the standard buckets. 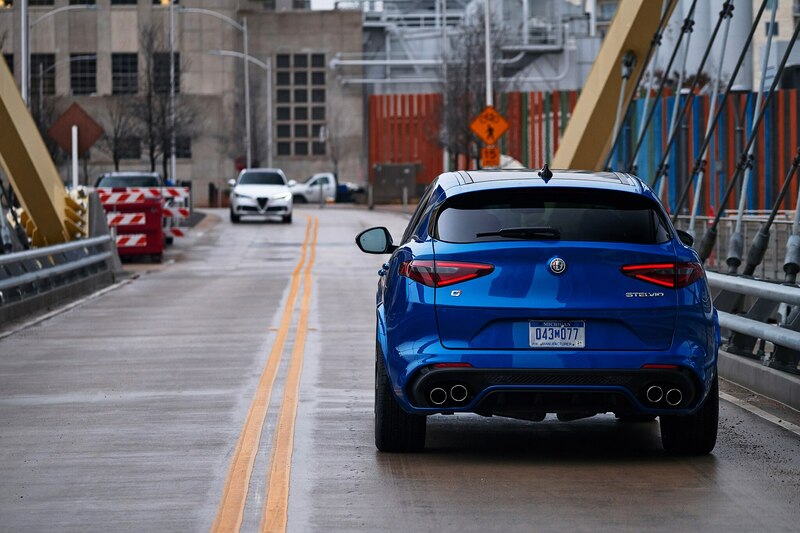 We’d probably skip ‘em. 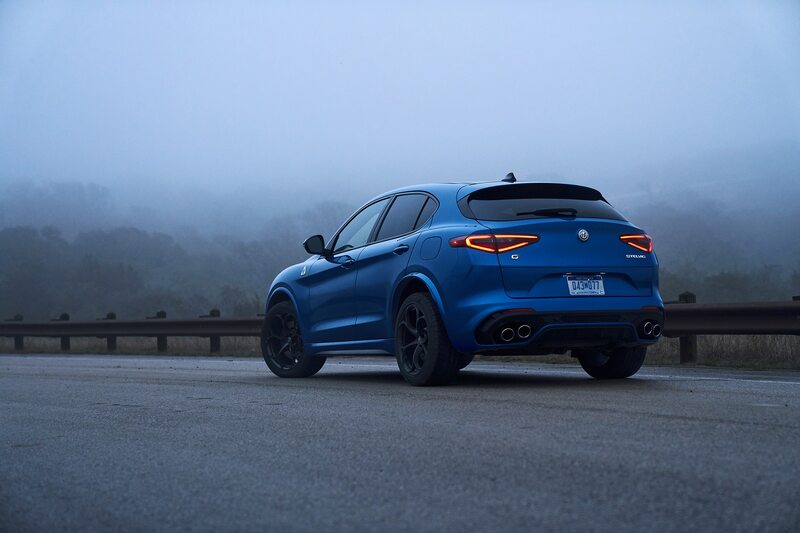 Body roll is shockingly minimal. 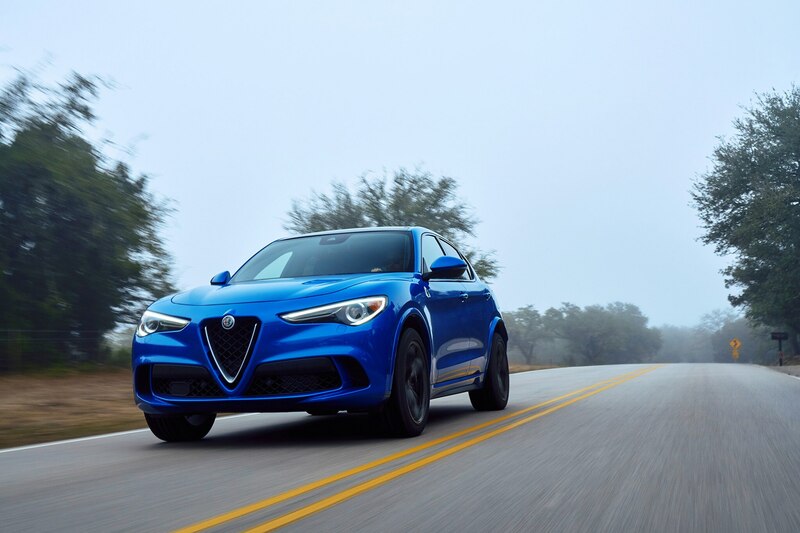 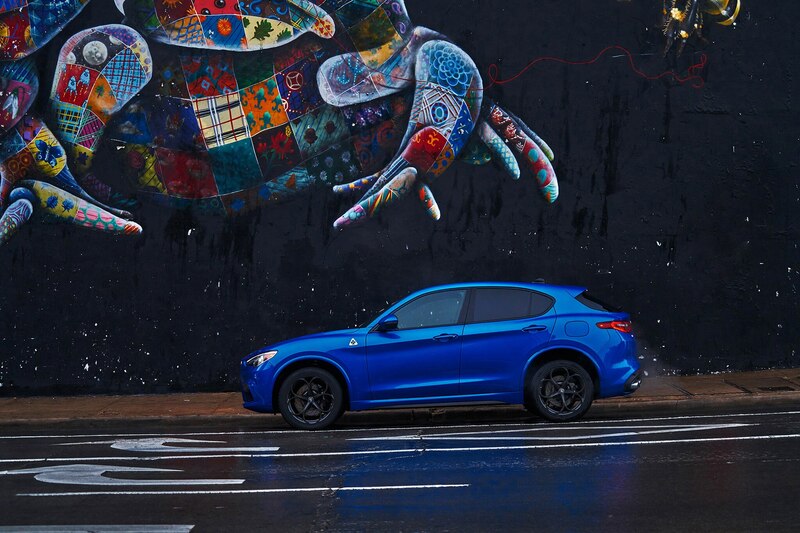 When the Stelvio Quadrifoglio hits Alfa dealerships in June of this year, the base price will be $81,390, or roughly $6,000 more than the Guilia Quadrifoglio. 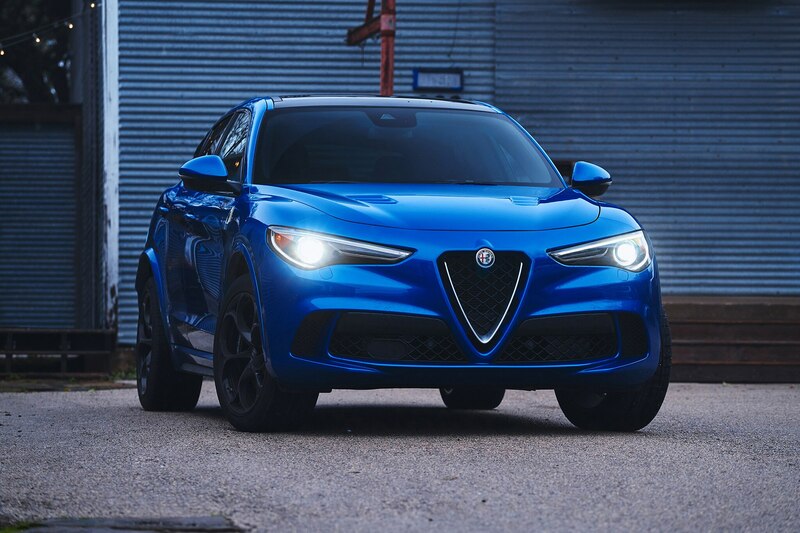 Alfa expects the take rate for the Quadrifoglo version to be roughly 10 percent, about the same split as the Giulia currently enjoys. 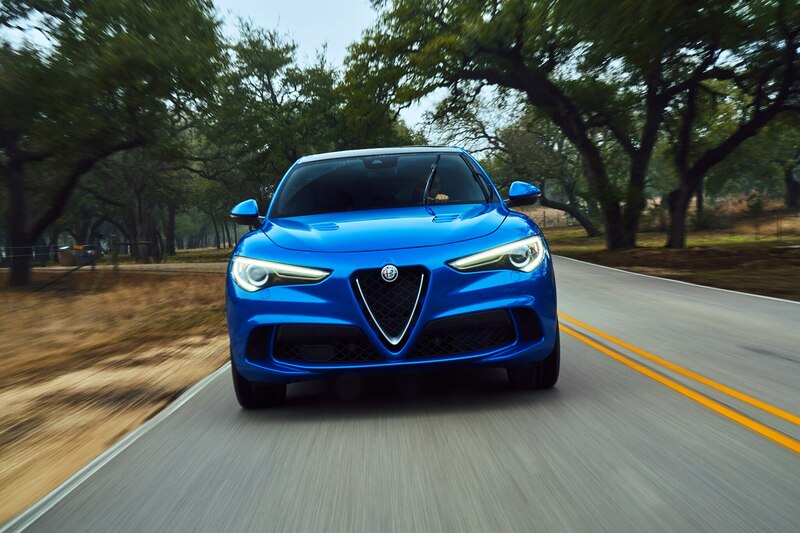 Whether you find enough to like about the Stelvio versus the Giulia to spend the extra money is purely a personal decision, but we’re envious of anyone having to make it.